Is the overt commercialisation of Christmas drowning out its true spirit? 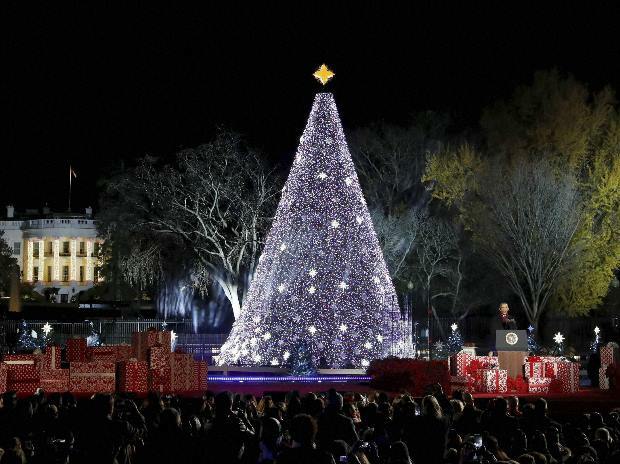 The US National Christmas Tree is likely to remain dark and closed to the public on Christmas eve amid the partial government shutdown that according to authorities has "complicated" repairs for the tree damaged by a man who climbed up the blue spruce last week. The National Park Service (NPS) on Sunday announced that the Christmas tree will stay dark during the shutdown, which was expected to be lengthy. "During the federal government shutdown, the White House Visitor Centre and National Christmas Tree site will be closed," the announcement on the NPS website said. The tree, which is located by the White House, was damaged when an "emotionally distressed" man tried to climb it on Friday. The man stayed on the tree for about an hour before he was talked into climbing down. As he descended, he got tangled in the lights and damaged some of them, the Hill newspaper reported. Now, with no funding in sight for the repairs, the NPS said that the tree will remain inaccessible and decidedly un-festive until there is a breakthrough on the Capitol Hill. The partial shutdown that officially kicked in on Friday midnight has dealt a blow to several national parks and landmarks forcing them to close their doors to visitors during the holiday season. However, Washington was apparently not following in the footsteps of New York and Arizona, who, despite being hit equally hard by the shutdown, kept up on the bills for the Statue of Liberty and the Grand Canyon, allowing them to stay open during the weekend.